When George Miller’s Fury Road first burst onto our screens in 2015, we were greeted with a novel concept, a truly likable post millennium film. In our cynical world we’d forgotten the beauty of a movie which doesn’t over think, looks artistically incredible and has a simple plot. Max is a drifter, captured by renegades who seek his blood, forced into servitude. A tyrannical dictator named ‘Joe’ keeps several women captive, hoping to conceive a suitable heir, their beauty and purity unmatched. Max and Joe collide, the women in both their lives suitably liberated and the pursuit is on. 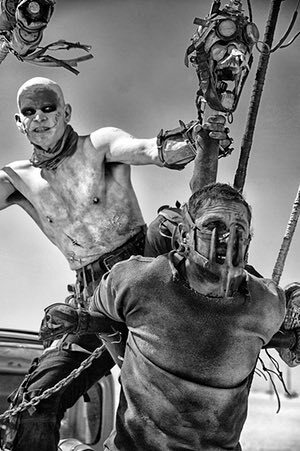 At its heart, Mad Max is a road movie, everything from Max himself to the metal guitarist (now perhaps more infamous for refusing to help inaugurate Donald Trump) strapped firmly to a hood. In this new edition some 24 months later we’re treated to a picture entirely converted to black and chrome, something that creates a unique opportunity to have a revaluation of a modern blockbuster. While it’s impossible to say exactly what effect this monochrome effect has on modern film precisely, we can say that it looks incredible in its usage here, the darkness is more effective when it needs to be and there’s a sinister edge of horror comparable to the opening gambit of Mad Max 2. By removing the color from our screens the director has created a violently drawn image which we’re almost transfixed on. It’s art. Like Alfred Hitchcock and Rod Stirling before him, Miller has purposefully chosen to avoid color, feeling that his choice of black and chrome may add that additional character the movie has been seeking. Miller calls this his superior version, and while I’m likely to agree, would remind viewers that the “original” version is just as good.